the joy of sculpting in clay in a relaxed and inspiring atmosphere with the expert instruction of a nationally know artist and instructor and the camaraderie of a small group of learners. 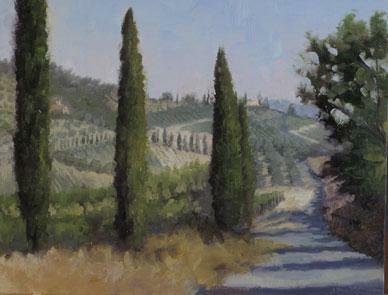 -Day trip to Lake Trasimeno & Isola Maggiore to paint or visit with lunch provided. Lightweight easel: A plein air easel, such as an Anderson (this is one I use a lot, but they are no longer available on Jerry’s), Open Box M, or Soltek. Keep in mind the weight limit of your luggage for your flight over. www.jerrysartarama.com or www.openboxm.com are 2 sites you can look at, or google “plein air easel”. Some plein air easels such as Guerrilla Painter www.guerrillapainter.com include slots for wet paintings, so you won’t need as many wet painting carriers. Paints: Either oils or water mixable oils. Titanium white, Cadmium Yellow Light, Naples Yellow, Yellow Ochre, Cadmium Red Deep, Alizarin Crimson, Burnt Sienna, Phthalo Blue, Ultramarine Blue and Ivory Black are suggested colors. Leave out Naples Yellow and Burnt Sienna if you’re short on space. I like either Winsor and Newton or Gamblin oils, and either Duo or Artisan water mixable oils. Solvents: Mineral spirits will be provided or Turpenoid can be bought at the local arts supply store. Bring a metal tank with a good clasp to store it in. If you’re using water mixable oils, you will only need a clip on water cup. Mediums: not required. I don’t use mediums myself. Brushes: A range of brushes, mostly hog bristle, sizes 2,4,6,8,10,and 12, some filberts, some flats, plus a few smaller softer synthetic brushes in good condition. Palette knife, palette, palette cover (I use a disposable palette for out of town painting, plexiglass when at home)Guerilla Painter makes a covered paint tray in 9”x12” for about $30 www.jerrysartarama.com. Paper towels, plastic bags and baby wipes may aslo be bought in Cortona. Water, a snack, hat with brim, sunscreen, bug spray, plastic gloves if wanted, Apron or smock if desired, and backpack or shoulder bag to carry supplies in. Paper towels, plastic bags and baby wipes. Bring a few and buy more later. 10 – 12 Canvas panels, and wet paint carriers in corresponding sizes (Ray Mar, or Utrecht, etc. )Suggested sizes: 8”x10”, 9”x12”, or 11”x14” Best to start small until you see what size you can finish in the allotted time period. It’s easier to use one size, such as 11”x14” on a trip so that you can use the carrier daily for that day’s paintings, and then use it again for the wettest paintings for the trip home. You’ll need at least one carrier, but bring two if you can fit it in your suitcase! Also bring a roll of wax paper to put between the “dry” paintings for the trip home. Umbrella- at home I use the “Shade Buddy”, but it’s way too big for overseas flights. A small, collapsible umbrella like the Multi Mount collapsible umbrella at www.jerrys.com ($50) would be good for travel, but I wouldn’t use it if it’s windy. A small collapsible car shade just to shade your palette is helpful, but won’t shade you.